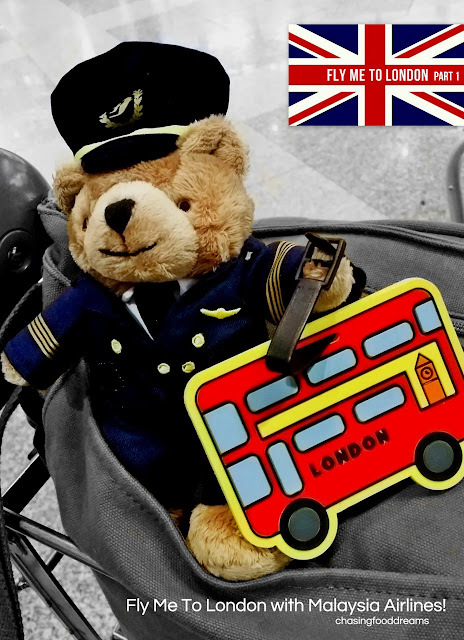 Wait for Me London… Here I Come! London, one of the most visited cities in the world, has travelers constantly making their rounds to the capital city of England. It would be my first visit to London as I have never been in prior to all my travels. Thrilled to be a part of the FAM group heading to London from a collaborative effort of UK Visit Britain, Malaysia Airlines Berhad (MAB) and Dorsett Shepherds Bush London, we arrived at Kuala Lumpur International Airport (KLIA) early in the wee hours of one Sunday morning in November. And how beautifully phrased it is… London, set on the River Thames, is a leading global city in the eyes of the world. It is a world cultural capital where many flocks for arts, history, education, fashion, entertainment, finance, tourism and so much more. Let’s not forget the world most beloved Diana, Princess of Wales and all the British Monarchy histories that takes place in this part of England. London also holds titles for world’s largest city airport system in Heathrow Airport due to it being the most visited city in the world. 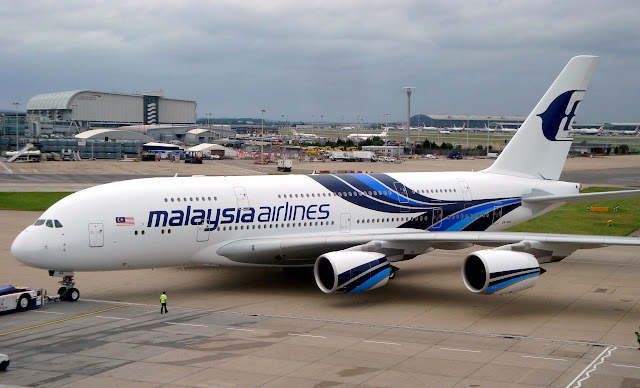 As we were travelling to London on Malaysia Airlines (MAB) Airbus A380, we also found out that this flight marks 41 years of connectivity between London and Malaysia since 1974. MAB’s big bird, A380, has been soaring through the sky for many flyers from Kuala Lumpur to London twice daily (at 10.10am or 11.30pm SGT) and has continue to be a preferred choice for this 14 hour journey. Embarking on a new journey as Malaysia Airlines Berhad since 1 September 2015, MAB continues to fly high to many countries, taking their flyers to new experiences with our nation’s airline. Malaysia Airlines is a part of oneworld®, which brings together 15 of the world’s biggest and best names in the airline industry and 30 affiliate airlines serving more than 10,000 daily departures. 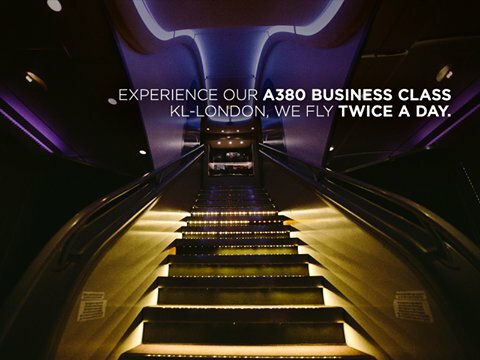 Through this global alliance Malaysia Airlines offers the best connectivity with seamless journeys to almost 900 destinations across 150 countries and access to over 550 airport lounges worldwide. #Todayishere and to be able to experience the Airbus A380 with MAB is an unforgettable experience! The four-engine jet airliner with a double-deck wide body is the world’s largest passenger airliner. Taking flight with 494 passengers on board with 8 open suite First Class seats, 66 flatbed Business Class seats and 420 standard Economy Class seats, this big bird makes traveling a breeze. 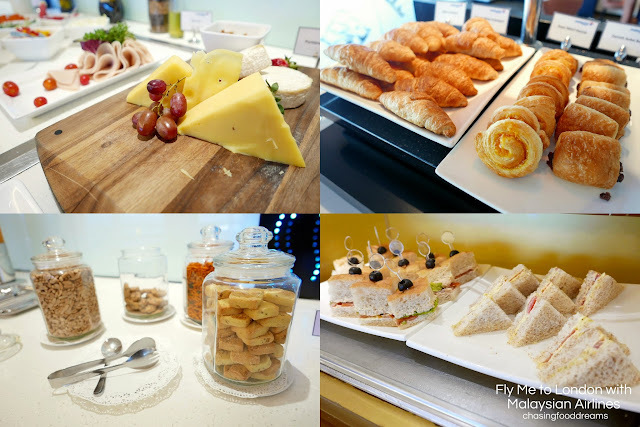 Before we board our flight, we made our way to experience some pre-flight pampering at MAB’s Platinum Golden Lounge located at the Satellite building. The MAB Golden Lounge, occupies one section of the Golden Lounge, is accessible by passengers traveling on Malaysia Airlines on Business Class and Enrich Gold members as well as First Class and Enrich Platinum members. The MAB Platinum Lounge located in another section in the same Golden Lounge, is only accessible by First Class passengers and Enrich Platinum members. Upon entering, there is an area for passengers to leave their luggage and enjoy the special lounge privileges in comfort. Simply check-in at the Golden Lounge counter with the provided access passcode and passengers will be directed accordingly to the respectively lounge. The sweetest greeting came from Shazeela as we check-in to our lounge! First up, we had the honors of visiting the MAB Platinum Lounge where passengers can revel in the comforts of lux before taking off. Section into various spaces, one sets foot in the plush haven of a majestic living area at first sight. Set with a backdrop of illuminated lite wall panels set in white, this exclusive area is design with elegance in mind. Enjoy the plush high back armchairs paired with low coffee tables set parallel to the beautiful backdrop as well as the aisle leading into a large waiting space. Head on over to the main area where there are plenty of comfortable and plush sofas to allow passengers to relax and simply enjoy quiet moments of their own personal time in a spacious area. A side buffet offers passengers light refreshments of fruits, pastries, sandwiches, cheese and beverages. MAB wait staff dressed in the national carrier’s trademark batik printed kebaya offers discreet services with a smile at all times. For passengers who smokes, there is a smoking room coupled with prestige leather armchairs for their perusals. 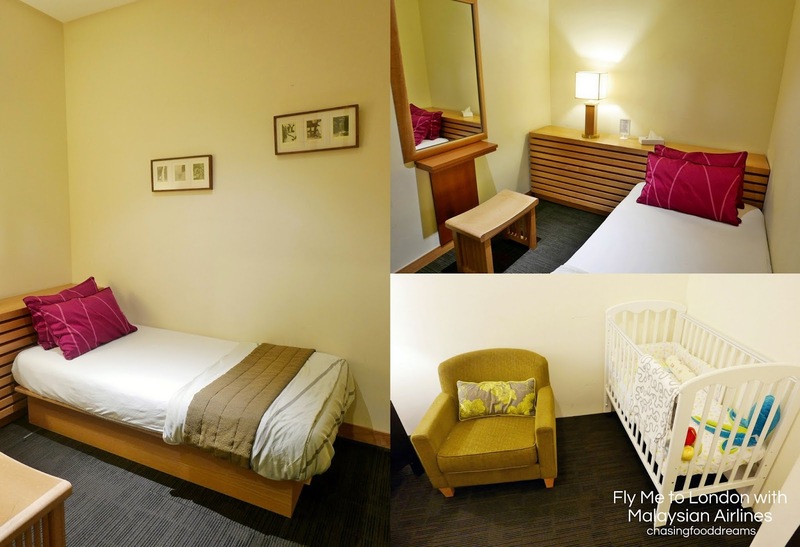 Passengers who has long layovers will be glad to know that the Platinum Lounge offers Slumberette rooms with beds as well as a dressing area plus large full bathroom facilities and also a baby room with baby cot for the precious ones. The bathroom has shower rooms that comes with decent bathroom amenities including towels, shampoos, soaps, toothbrush, toothpaste, comb and even hair dryers. Dressed in dark tiles, the contrasting room is brighten up with splashes of colors from orchids. There is also a dining lounge where one is served from an a la carte menu as well as a small selection of dining items on the buffet. Dine, wine and relax, taking in sights of the bustling airport activities outside the building. We toasted and feasted on platters of freshly made-to-order breakfast treats of French Toast, English breakfast as well as our national favorite, Nasi Lemak together with Pilot Parker. Looking forward to an adventure in London, we are glad that Pilot Parker is joining us again on our escapade as he last did in Labuan here. First Class passengers are also treated to an exclusive epicurean menu prepared by UK’s Michelin star acclaimed Chef Gary Rhodes, in a collaborative effort with Malaysia Airlines and British High Commission, at this Platinum dining area where a specially prepared 3-course menu will be served. To check out more on this exclusive menu, head on over to this link. Next, we took a tour of MAB Business Golden Lounge. This lounge is definitely bigger and heavily populated with many passengers compared to the Platinum lounge. The lounge area is also sectioned to various spaces to allow a choice of ambiance should one prefer to be near the window with sunlight or the much cooler space inside the area. Long buffet counters are spread all over together and passengers can opt for a casual and comfy seating or proper dining area too to savor the spread of local and international dishes and beverages. To keep everyone entertain, there are magazines, children playroom, games room, private sleeping lounges as well as massage services run by private owner. 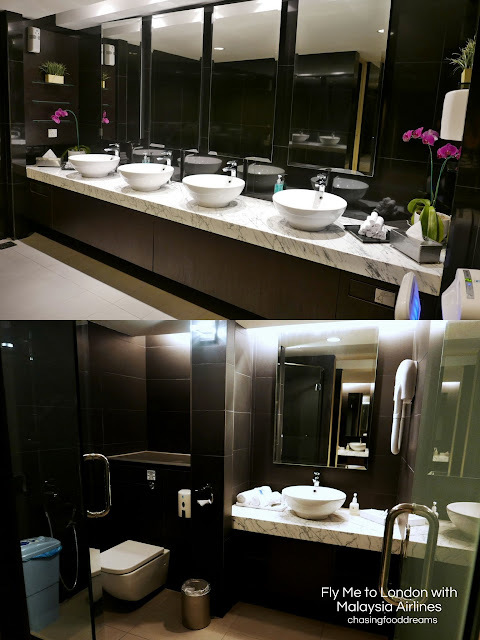 The bathrooms are also spacious and has all the amenities to freshen up and shower for long haul in transit flights. The Golden Lounge also has a business center where one can enjoy the private facilities of meetings, business activities as well as the use of proper workstations. 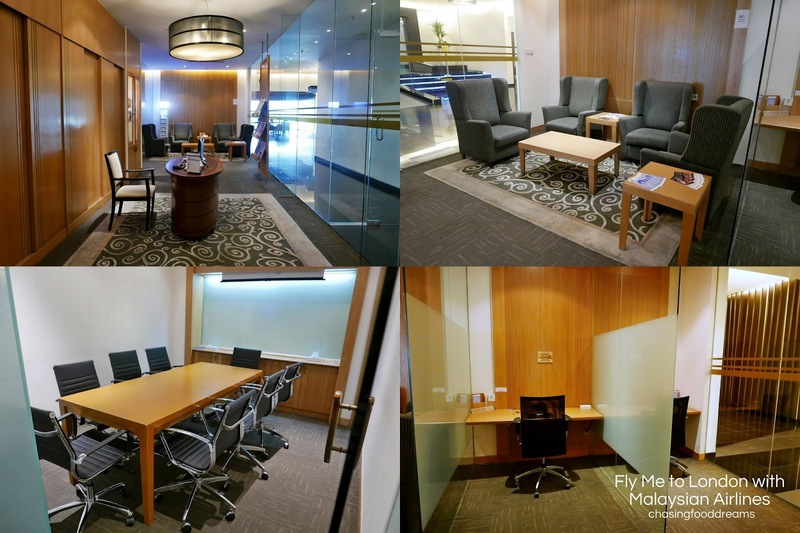 A boardroom is also available for group meetings as well as a casual lounging area. Office facilities are also offered if required. Wifi is available through the whole Golden Lounge area at all times. Greeted by the warm smiles from the MAB flight attendants, we boarded the Economy section of the flight. A staggering seating of 420 economy seats, our flight was relatively full that morning. While checking in online 48 hours prior to the flight, one can head on over to SEATGuru to choose your seats according to your preference. Each seat has a set of pillow, blanket and headphone placed ready for the passenger for this long 14 hour flight. As soon as we were seat and all luggages safely stowed in the overhead compartments, we were also handed our UK Landing card for us to fill up in preparation for the immigration office at Heathrow airport. There is the usual screen monitor which displays all the flight information as well as the entertainment part for the passengers. Glad to be able to book the seat next to the flight exit, legroom space was plenty and comfortable. In addition, one can also charge our electronic items on board. Our flight took off smoothly, letting us experience how stable the Airbus A380 was as well as the skill set of the pilots. Soon we were up in the air and excitement pushes on further as we are now officially heading to London! 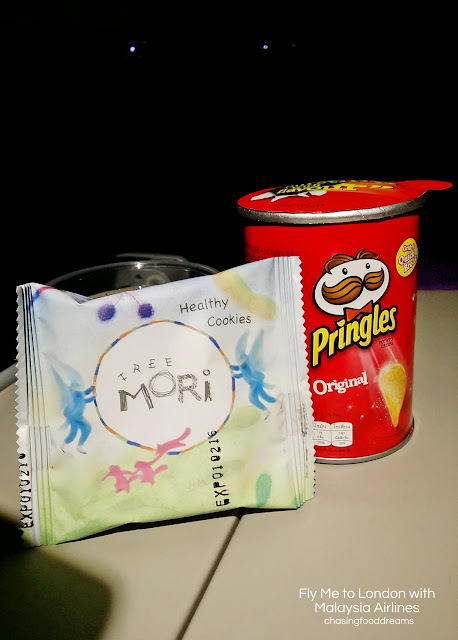 As soon as we were up in the air, MAB flight attendants began to serve light refreshments of beverages or wine of your choice together with my favorite MAB peanuts! We enjoyed two main meals on board as well as snacks served in between meals. While the meals on board were decent in our KL to London journey, the meals on board were delicious in our London to KL journey. 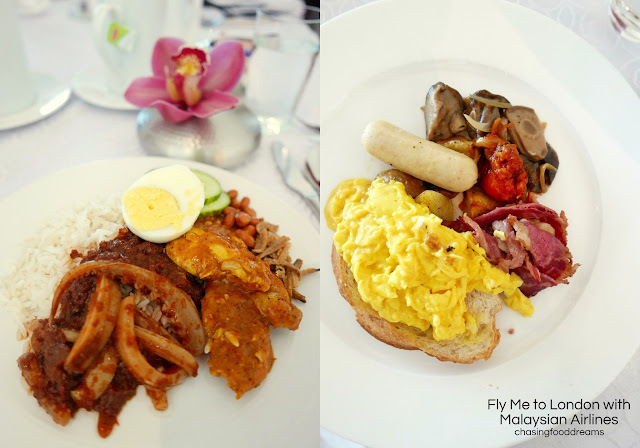 My most memorable meal on board was the Nasi Lemak served in our journey back to KL where the coconut rice was rich, creamy and fluffy and the curry chicken was cream, spicy and flavourful. I heard their Beef Rendang was a hit as they ran out before we could opt for that! 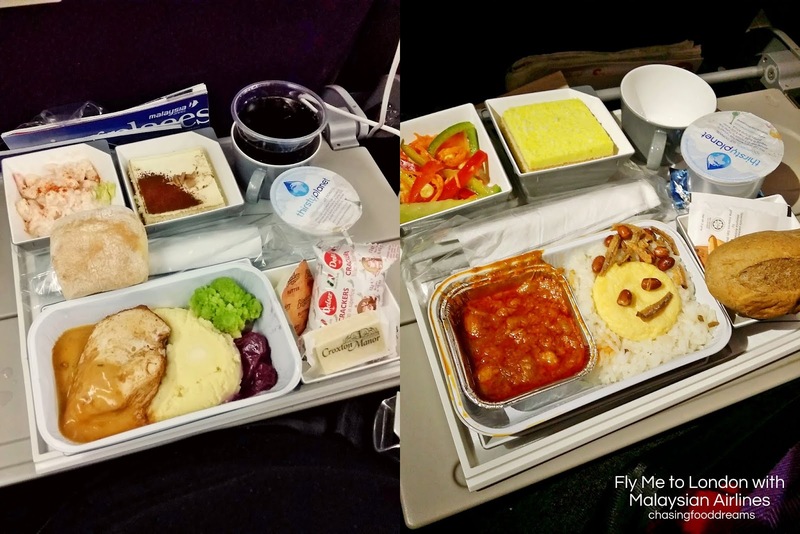 Have you ever wonder how the hardworking flight attendants deal with these long journeys on flight? Our gracious and friendly flight attendant Mik took us to the staff area to check out where flight attendants on board take turns to rest. It’s such a neat sight as there were bunk beds with private curtains available for the staff to rest in turns of each other. Thank you Mik for the tour! All in all, we landed in Heathrow airport on time as scheduled. It is always a crucial point in any travels to be able to arrive on time per schedule in order for a smooth and worry-free travel. With Malaysia Airlines, it is their priority to make sure that passengers are comfortable and on time when experiencing the national carrier’s services. We arrived at Heathrow airport and made our way to the immigration office easily and was soon heading out to the airport in glee. At the airport, one can head on over to the tourist services area where one can purchase SIM cards for phones as well as other transportation services and hotel services. It’s my second experience traveling with MAB in their travel program and I must say that the MAB flight crews and ground staff displayed warmth and gracious courtesy towards us. They did not know that we were part of the MAB travel program with this said. Both our journeys were made personable and I do commend them for their efforts in this challenging service industry. Traveling with MAB always reminds me of my homeland with personable services from MAB crew in our iconic batik printed kebaya, local food on board as well as our Malaysian warm hospitality. Thank you Malaysia Airlines for showing us what MAB has to offer in our future travels and we definitely look forward to more beautiful experiences to come when we #Keepflying on MAB! 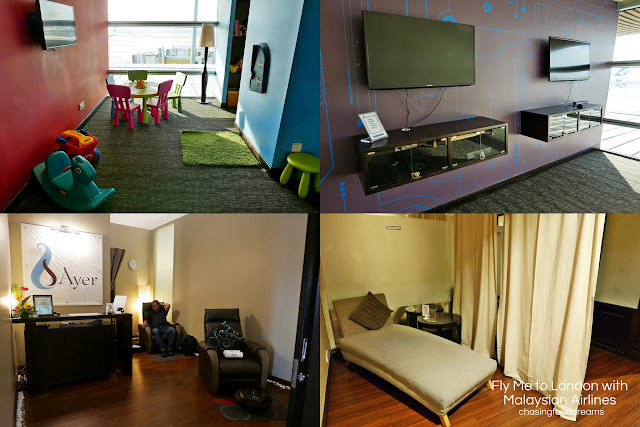 This trip was made possible by Malaysia Airlines, UK Visit Britain and Dorsett Shepherd’s Bush London. All stories and comments in my posts are purely derived from my own experiences through the trip. *Look out for more posts coming on UK Visit Britain sites as well as our stay at Dorsett Shepherd’s Bush London!